My visit to Rose Bakery was somewhat of a pilgrimage as I have been baking from and a huge fan of their amazing cookbook ‘Breakfast, Lunch and Tea’ (see my rhubarb tart) and wanted to see and taste first hand the deliciousness of their creations. Rose Bakery is unlike your typical French patisserie. It is much more…British. And that’s because Rose Carrarini (who is English) and her husband Jean-Charles (who is French) are the dynamic duo behind it. There isn’t in fact a croissant or pain au chocolat in sight. 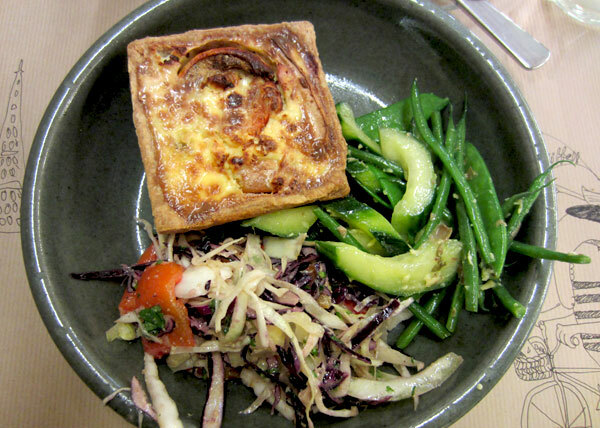 Since opening in 2002 there are now two branches of Rose Bakery with Parisians queuing out the door for the luscious cakes, tarts, quiches and fresh salads. And you know from entering the bakery that they mean business. The space is simple and the majority of it belongs to the kitchen and a display counter of the days delights fresh from the oven. 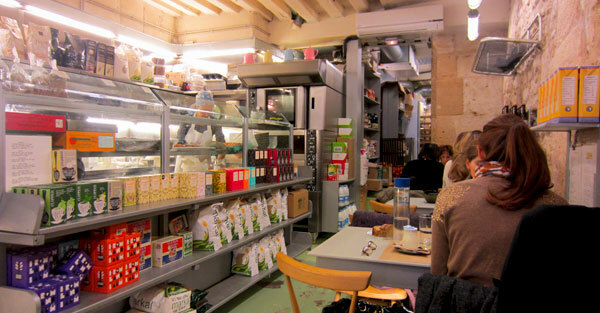 A single row of tables line the other length of the bakery, seating no more than 30. We arrived just after midday and there were a couple of tables available but before long the place was full. Mouths watering we ogled at the rows of cakes and savoury tarts and watched as the pastry chef behind the counter was rolling out more dough. Savoury cravings won out in the end and we ordered a roast vegetable and a courgette tart which comes with a selection of salads. The tarts were delicate. Airy fillings which were more like a quiche with crisp buttery pastry cases. 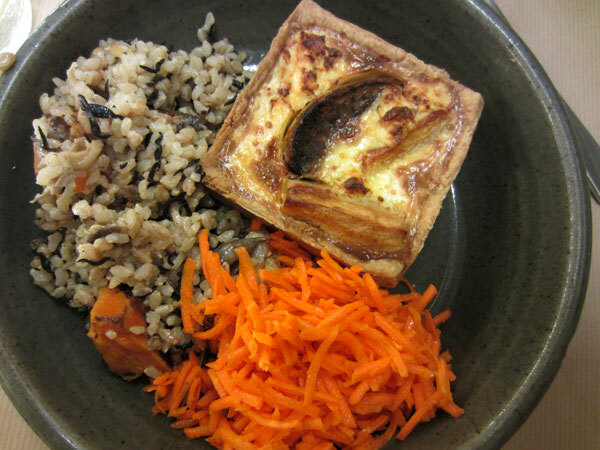 The salads fresh and interesting flavours of beans with ginger and sesame, carrot and cumin and a nutty wild rice. 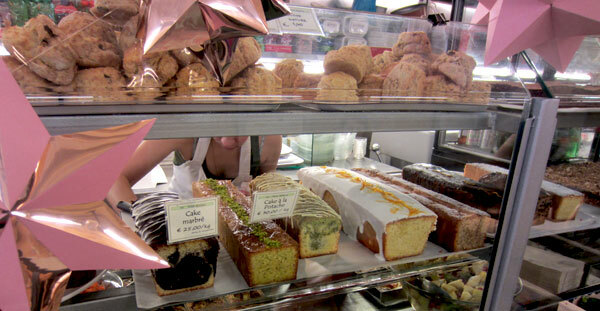 If you can’t squeeze in a slice of cake or fresh scone after your brunch, it’s ok, they do take-away! And I suggest you don’t leave empty handed. Rose Bakery is definitely worth a visit for a delicious brunch in a very ‘un-French’ like setting. It is a little on the pricey side but being able to watch the bakes come out of the oven and onto your plate I think justifies it.